The RG series, the most popular metal thin film chip resistors because of their high precision, high reliability and long-term stability, is the base of our line-up of new innovative products: a higher precision, higher operating temperature, higher power handling capability, higher anti-surge capability version of the RG series and so on. All of these products employ the inorganic passivation technology that enables high precision and high reliability. In addition, our thin film based terminal technology does not involve any Ag (silver) and they are sulfur impervious. 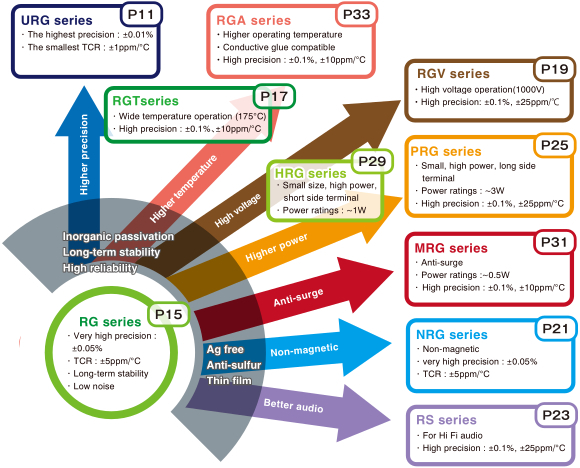 The following diagram shows distinctive characteristics of these products and their relationships. Thin film resistors are highly reliable and stable over long periods of time. 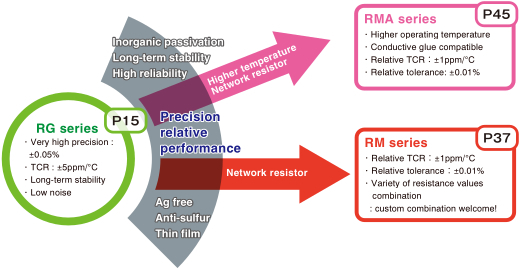 The diagrams below show the matrix of Susumu's thin film resistors based on tolerance with TCR , and tolerance with power ratings. The high power resistors are offered in two different terminal configurations; PRG series -long side terminal and HRG series - short side terminal, to meet your need for miniaturization using same power. The diagram below illustrates how we expanded our current sensing chip resistors in order to meet the need for miniaturization and high power ratings. We also offer 4 terminal current sensor isolating voltage terminals, making it easier to mount on the board. We will continue to expand current sensing chip resistor series corresponding the needs of the market.